BOTTOM LINE: Despite its flaws in execution, this show has a witty, joke-filled script that produces plenty of audience laughter. With the arrival of apps like Tinder, which focus more on quick meetups and physical attractiveness than getting to know someone through correspondence, the world of online dating has become more and more about a quick hookup. This phenomenon is explored in Swipe Right, a play that centers around Brad (Franck Juste), “a douche canoe” who uses Tinder to book four dates in one night at the same bar. (The premise of the play is apparently based on the real-life experiences of writer and director Allison Young). Brad's story is told by The Narrator (Saer Karim), who makes sarcastic comments and breaks the third wall by addressing both the audience and the characters. Watching the disastrous dates unfold are Joey the waitress (Aly Pentangelo) and John the bartender (Andre Pizarro). When John’s college friend Hannah (Sara Kohler) arrives for a Tinder date with Brad, John warns her about Brad's creepy ways. Hannah then spends the rest of the night at the bar watching as increasingly disinterested women arrive for their dates. Young shows a lot of strength and potential in her comedic writing. There is also originality in regards to the function of the play’s narrator; the commentary he provides is often quite clever and on point. One particularly funny scene occurs when Joey and The Narrator team up to provide sports newscaster-type play-by-play commentary as Brad flubs up his date. Detailed and realistic props also help add to the atmosphere of setting the scene of bar. The jokes are at their best when they note the production's own Festival-based limitations: jokes riffing off of the fact that most of the dates are all played by the same actor in the same outfit (Christine Penski), or that the bar only has two barstools. However, the acting abilities of the cast vary and a few seem a bit nervous (Aly Pentagelo and Franck Juste are among the more skilled cast members). The loudness of the fans and air conditioner in Teatro LATEA also drowns out some of the dialogue, so that some of the jokes get lost (sit close). The storyline itself, which provides an ideal situation for witty one-liners, could benefit from a bit more development and complexity. 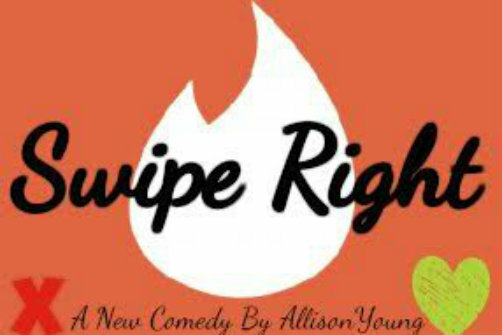 Swipe Right is the type of show that has a lot of great potential, and with a bit of practice and streamlining, could surely be a great comedy.